THE TRUE PROBLEM OF CHRISTIAN EXPERIENCE. Revelations ii. 4.--"Nevertheless, I have somewhat against thee, because thou hast left thy first love." THERE are some texts of scripture that suffer a much harder lot than any of the martyrs, because their martyrdom is perpetual; and this I think is one of the number. Two classes appear to concur in destroying its dignity; viz., the class who deem it a matter of cant to make any thing of conversion, and the class who make religion itself a matter of cant, by seeing nothing in it but conversion. I. The relation of the first love, or the beginning of the christian discipleship, to the subsequent life. II. The relation of the subsequent life, including its apparent losses, to the beginning. What we call conversion is not a change distinctly traceable in the experience of all disciples, though it is and must be a realized fact in all. There are many that grew up out of their infancy, or childhood, in the grace of Christ, and remember no time when they began to love him. Even such, however, will commonly remember a time, when their love to God and divine things became a fact so fresh, so newly conscious, as to raise a doubt, whether it was not then for the first time kindled. In other cases there is no doubt of a beginning,--a real, conscious, definitely remembered beginning; a new turning to God, a fresh-born christian love. The conversion to Christ is marked as distinctly as that of the Ephesian church, when coming over to Christ, from their previous idolatry. The love is consciously first love, a new revelation of God in the soul; a restored consciousness of God, a birth of joy and glorified song in the horizon of the soul's life, like that which burst into our sky when Jesus was born into the world. 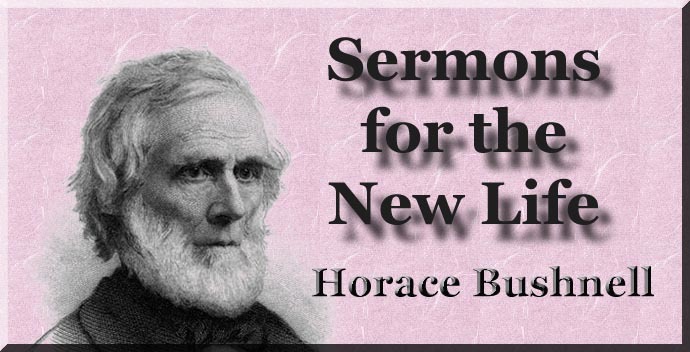 All things were new,--Christ was new, the word a new light, worship a new gift, the world a new realm of beauty shining in the brightness of its author: even the man himself was new to himself. Sin was gone, and fear also was gone with it. To love was his all, and he loved every thing. The day dawned in joy, and the thoughts of the night were songs in his heart. Then how tender, how teachable; in his conscience how true, in his works how dutiful. It was the divine childhood, as it were, of his faith, and the beauty of childhood was in it. This was his first love, and if all do not remember any precise experience of the kind, they do, at least, remember what was so far resembled to this as to leave no important distinction. I. What now is the import of such a state, what its relation to the subsequent life and character? It is not, I answer, what they assume, who conceive it to be only a new thought taken up by the subject himself which he may as naturally drop the next moment, or may go on to cultivate till it is perfected in a character. It is more, a character begun, a divine fact accomplished, in which the subject is started on a new career of regenerated liberty in good. I answer again that it is not any such thing as they assume it to be, who take it as a completed gift, which only needs to be held fast. It is less, far less than this. To God it is one of his beginnings, which he will carry on to perfection; to the subject himself it is the dawn of his paradise, an experience that will stand behind him as an image of the glory to be revealed before, an ideal set up, in his beatitude, of that state in which his soul is to be perfected and to find its rest. In one view, indeed, it is a kind of perfect state,--a state resembled to innocence. It is free, it is full of God, it is for the time without care. New born, as it were, the spirit of a babe is in it. The consciousness of sin is, for a time, almost or quite suspended,--sin is washed away, the heart is clean. The eye is single, as a child's eye. The spirit is tender, as a child's spirit,--so ingenuous, so pure in its intentions, so simple in its love, that it even wears the grace of a heavenly childhood. In this flowering state of beauty the soul discovers, and even has in its feeling the sense of perfection, and is thus awakened from within to the great ideal, in which its bliss is to be consummated. The perfection conceived too and set up as the mark of attainment, is something more than a form of grace to be hereafter realized. It is now realized, as far as it can be--the very citizenship of the soul is changed; it has gone over into a new world, and is entered there into new relations. But it has not made acquaintance there; it scarcely knows how it came in, or how to stay, and the whole problem of the life-struggle is, to become established in what has before been initiated. There is a certain analogy between this state, paradisaically beautiful, pure, and clean, and that external paradise in which our human history began. What could be more lovely and blessed, what in a certain formal sense more perfect than the upright, innocent, all-harmonious childhood of the first human pair. But it was beauty without strength, the ingenuous goodness of beings unacquainted with evil. A single breath of temptation is enough to sweep it all away. The only way to establish it is to lose it and regain it. Paradise lost and regained is not a conception only of the poet, but it is the grand world-problem of probation itself. No state of virtue is complete, however total the virtue, save as it is won by a conflict with evil, and fortified by the struggles of a resolute and even bitter experience. Somewhat in the same way, it is necessary that a christian should fight out the conquest of his paradise, in order to be really established in it. There is no absolute necessity that he should lose it, nor any such qualified necessity as there was that the first man should fall from his integrity; for he is, by the supposition, one who has learned already the bitterness of evil, by a life thus far steeped in the gall of it. He has been outside of his paradise, to look on it from thence, as Adam had not. He has only not been inside long enough to thoroughly understand the place. He will commonly never be established in it, therefore, till he knows it more experimentally, and gets wonted in it. And yet there are a few, as I verily believe, who never go outside again, from the moment of their first entering, but stay within, unfolding all their life long, as flowers, in their paradise,--trustful, ductile, faithful, and therefore unfaltering in their steadfastness. Still the probability that any one will continue in the clearness and freshness of his first love to God, suffering no apparent loss, falling into no. disturbance or state of self-accusing doubt, is not great. And where the love is really not lost, it will commonly need to be conquered again, over and over, and wrought into the soul by a protracted and resolute warfare. The germ that was planted as impulse must be nourished by discipline. What was initiated as feeling must be matured by holy application, till it becomes one of the soul's own habits. A mere glance at the new-born state of love discovers how incomplete and unreliable it is. Regarded in the mere form of feeling, it is all beauty and life. A halo of innocence rests upon it, and it seems a fresh made creature, reeking in the dews of its first morning. But how strange a creature is it to itself,--waking to the discovery of its existence, bewildered by the mystery of existence. An angel as it were in feeling, it is yet a child in self-understanding. The sacred and pure feeling you may plainly see is environed by all manner of defects, weaknesses, and half-conquered mischiefs, just ready to roll back upon it and stifle its life. The really sublime feeling of rest and confidence into which it has come, you will see is backed, a little way off, by causes of unrest, insufficiency, anxiousness and fear. Questions numberless, scruples, fluctuating moods, bad thoughts, unmanageable doubts, emotions spent that can not be restored by the will, novelty passing by and the excitements of novelty vanishing with it,--there is a whole army of secret invaders close at hand, and you may figure them all as peering in upon the soul, from their places of ambush, ready to make their assault. And what is worst of all, the confidence it has in the Spirit of God, and which, evenly held, would bear it triumphantly through, is itself unpracticed, and is probably underlaid by a suppressed feeling of panic, lest he should sometime take his leave capriciously. It certainly would not be strange, if the disciple, beset by so many defects and so little ripe in his experience, should seem for a while to lose ground, even while strenuously careful to maintain his fidelity. And then Christ will have somewhat against him. He will not judge him harshly and charge it against him as a crime that has no mitigations; it will only be a fatal impeachment of his discipleship, when he finally surrenders the struggle, and relapses into a prayerless and worldly life. II. In a consideration of the subsequent life, as related to the beginning, orfirst love. The real object of the subsequent life, as a struggle of experience, is to produce in wisdom what is there begotten as a feeling, or a new love; and thus to make a fixed state of that which was initiated only as a love. It is to convert a heavenly impulse into a heavenly habit. It is to raise the christian childhood into a christian manhood,--to make the first love a second or completed love; or, what is the same, to fulfill the first love, and give it a pervading fullness in the soul; such that the whole man, as a thinking, self-knowing, acting, choosing, tempted and temptible creature, shall coalesce with it, and be forever rested, immovably grounded in it. The paradise of first love is a germ, we may conceive, in the soul's feeling of the paradise to be fulfilled in its wisdom. And when the heavenly in feeling becomes the heavenly in choice, thought, judgment, and habit, so that the whole nature consents and rests in it as a known state, then is it fulfilled or completed. Then is the ideal awakened by the first love become a fact or attainment. See now, briefly, in what manner the experimental life works this fulfillment. At first the disciple knows, we shall see, very little of himself, and still less how to carry himself so as to meet the new state of divine consciousness, into which he is born. You may look upon him as literally a new, supernatural man, and just as a child has to learn the use of his own body, in handling, tasting, heaving, climbing, falling, running, so the new man learns, in the struggles of practical life, his own new nature,--how to work his thoughts, rule his passions, feed his wants, settle his choices, and clear his affections. Thus, at last, his whole nature becomes limber and quick to his love; so that the life he had in feeling, he can operate, express, fortify, and feed, At first, nothing co-operates in settled harmony with his new life; but, if he is faithful, he will learn how to make every thing in him work with it, and assist the edifying of his soul in love. A great point with him is the learning how to maintain his new supernatural relation of sonship and vital access to God. Conscious of any loss, or apparent separation, he is likely, at first, to throw himself out of God's peace only the more completely, by the panic he indulges, and the violent throes he makes to re-establish himself. The feeling in which he is raised to a participation of God can not instruct him how to maintain that participation, or to keep an open state of access. How to work his will, his inward suggestions and outward duties; how to shape his life and order his prayers, so as to set himself always before God, and command a ready approach, he knows, as yet, only by the guidance of his feeling. But the struggle of experience brings him into a growing acquaintance both with God and himself as related to God, removing in this manner his awkwardness, so that he is able to reject all false methods and all raw experiments, and address himself to God skillfully, as a friend will address a friend. He knows exactly how he must stand before God, to be one with him and abide in him. He comes into the secret of God easily and, as it were, naturally, and receives the manifestation of God as one who lives in the adoption of a son. In the same way, or by the same course of experience, he conceives more and more perfectly what is the true idea of character. At first, character is to him a mere feeling or impulse, a frame. Next, perhaps, it becomes a life of work and self-denial. Next a principle, nothing but a matter of principle. Next he conceives that it is something outwardly beautiful, a beautiful life. After a while, he discovers that he has been trying to mold what is spiritual by his mere natural taste, and forgotten the first love, as the animating life and divine principle of beauty, And so he draws himself on, by degrees, through all the variant phases of loss and self-criticism, to a more full and rounded conception of character, returning at last to that which lay in his first love. So that character is, at last conceived as a life whose action choice, thought, and expression are ail animated and shaped by the spirit of holiness and divine beauty which was first breathed into his feeling. Nothing is so difficult to settle as the conception of a perfect character; nothing, at the same time, so necessary. And every faithful christian will be conscious of a constantly progressive change, in his conception of what he is to be. A very great point to be gained, by the struggle of experience, is to learn when one has a right to the state of confidence and rest. At first the disciple measures himself wholly by his feeling. If feeling changes, as it will and must at times, then he condemns himself, and condemning himself perhaps without reason, he breaks his confidence toward God and stifles his peace. Then he is ready to die to get back his confidence, but not knowing how he lost it, he knows not where to find it. He had been at his business, and as that occupied his attention, it took off also somewhat of his feeling: charging this to the account of sin, and not to any want of experience in turning the mind so as to keep or recover its emotions, he put his conscience against him where it ought to have been his helper, and fell into the greater difficulty because he fell into mental confusion. Or perhaps he had played with his children, or he had talked in society about things not religious, in order to accommodate the circle he was in: this touched the delicate feeling of his soul; and, as feeling does not reason or judge, the wound was taken for admitted sin. On one occasion he did not give heed to some insignificant, or really absurd scruple. On another he declined some duty which really was no duty, and was better not to be done. In short, he was continually condemning and tormenting himself, and gratuitously forbidding himself all confidence toward God. But finally, after battering down his own confidence and stifling his love in this manner by self-discouragement for many years, he is corrected by God's Spirit and led into a discovery of himself and the world that is more just, ceases to condemn himself in that which he alloweth, so to allow himself in any thing which he condemneth; and now behold what a morning it is for his love! His perturbed, anxious state is gone. God's smile is always upon him. His peace flows down upon him as a river from the throne. His first love returns, henceforth to abide and never depart. Everywhere it goes with him, into all the callings of industry and business, into social pleasures and recreations, bathing his soul as a divine element. By a similar process he learns how to modulate and operate his will. On one side his soul was in the divine love. On the other he had his will. But, how to work his will so as perfectly to suit his love, he at first did not know. He accordingly took his love into the care of his will; for assuredly he must do all that is possible to keep it alive. He thus deranged all right order and health within by his violent superintendence, battered down the joy he wished to keep, and could not understand what he should do more; for, as yet, all he had done seemed to be killing his love. He had not learned that love flows down only from God, who is its object, and can not be manufactured within ourselves. But he discovers finally that it was first kindled by losing, for the time, his will. Understanding now that he is to lose his will in God's will, and abandon himself wholly to God, to rest in him and receive of his fullness; finding too that will is only a form of self-seeking, he makes a total loss of will, self, and all his sufficiency, whereupon the first love floods his nature again, and bathes him like a sea without a shore. And yet it will not be strange if he finds, within a year, that, as he once overacted his will in self-conduct, so now he is underacting it in quietism; that his love grows thin for want of energy, and, returning to his will again, he takes it up in God; dares to have plans and ends, and to be a person; wrestles with God and prevails with him; and so becomes, at last, a prince, acknowledged and crowned before him. His thinking power undergoes a similar discipline. At first, he doubted much, doubted whether he had a right to doubt, and whether he did doubt, and yet more how to get rid of his doubts. The clatter of his old, disordered, thinking nature began, ere long, to drown his love by the perpetual noise it made; old associations led in trains of evil suggestion, which, like armies of wrath, overran and desolated his soul. He attacked every one of them in turn and that kept him thinking of the base things he wanted to forget. He discovers, at length, that all he can do is to fill his capacity with something better,--his mind with truth, his heart with God and faith, his hands with duty, and all with the holy enthusiasm of christian hope; and then, since there is no room left for idle fancies and vain imaginations to enter, he is free, the torments of evil suggestion are shut away. The courses and currents of the soul are now cleared, and his thoughts, like couriers sent up through the empyrean, will return bringing visions of God and divine beauty to waken the pure first love and kindle its joyful flames. At first he had a very perplexing war with his motives. He feared that his motive was selfish, and then he feared that his fear was selfish. He dug at himself so intently, to detect his selfishness, as to create the selfishness he feared. The complications of his heart were infinite, and he became confused in his attempt to untwist them. He blamed his love to God because he loved him for his goodness, and then tried to love him more without any thought of his goodness. He was so curious, in fact, to know his motives that he knew nothing of them, and finally stifled his love in the effort to understand it, and act the critic over it. At length, after months or years it may be of desolation, he discovers, as he had never done before, that he was a child in his first love, and had a child's simplicity. And now he has learned simplicity by his trial! Falling now into that first simplicity, there to abide, because he knows it, the first love blooms again,--blooms as a flower, let us hope, that is never to wither. His motive is pure, because it is simple; and his eye, being single toward God, his whole body is full of light. Thus far it is supposed, in all the illustrations given, that the new love kindled by the Spirit has to maintain itself, in company with great personal defects in the subject. These defects are a constant tendency in him to defections that correspond. Whenever he yields to them, he suffers a loss which is, in that case, a guilty or blameable loss. But he will sometimes be reduced or let down, simply because, or principally because, he has too little skill or insight to avoid it. And this reduction will sometimes go so far as to be a kind of subsidence out of the supernatural into the natural state. He is confused and lost, and his very love appears to be quite dead. God is hidden, as it were, behind a veil, and can not be found. Duties kept up, as by the Ephesians, without liberty, yield no fruit of peace or blessing. And now, since it is not in the nature of a soul to stand empty and fight off evil, with no power left but a vacuum, it will not be strange if he lets in the world, grows light, covetous, ambitious, and has only a name to live. All this, in one view, is but thq working of his defects. Doubtless he is blameable, in a degree, though not as he would be if he had no such defects to contend with. Christ has somewhat against him, looks on him as one made subject to vanity not willingly, or willingly in part, and waits to restore him. His very losses too will be a lesson of experience really invaluable. He has learned his defects by his failures, and the day is not far distant when the dryness of his present experience will create, in his heart, an irrepressible longing for the recovery of the ground he has lost. For there is yet, slumbering in his memory, the dim ideal of a first love to Christ. Around that ideal are gathered many distasteful recollections and associations; but there ii a faint, sweet light of beauty in the center. And now as, in turn, the world itself palls, that faint spot of light remembered as the dawn of love to Christ, will grow radiant and beam as a sun upon him. As a prodigal he will return; as a prodigal returning, be met a great way off, and welcomed by his forgiving and rejoicing father. Now he is in his love as one instructed. His defects are corrected by his failures, and, by a common paradox of experience, supplemented by his losses; and so he is prepared to stand fast in his love. Sometimes a very dull and carnal, or capricious nature will go through this kind of bad experience more than once, and then will appear to be saved only so as by fire. But, more commonly, the time past of one such misery will suffice. You perceive, in this review, how every thing in the subsequent life of the disciple is designed of God to fulfill the first love. A great part of the struggle which we call experience, appears to operate exactly the ether way; to confuse and stifle the first fire of the spirit. Still the process of God is contrived to bring us round, at last, to the simple state which we embraced, in feeling, and help us to embrace it in wisdom. Then the first love fills the whole nature, and the divine beauty of the child is perfected in the divine beauty of a vigorous and victorious manhood The beginning is the beginning of the end, the end the child and fruit of the beginning. I am well aware that some will be dissatisfied with a view of the christian life that appears to anticipate so many turns and phases, and so much of losing experience. They will think it better to take a key-note that is lower, and start upon a level that can be maintained. Thus, if. we say nothing of a conversion, or the high experience involved in that term, and commence a course of devout observances and church formalities; or if, taking a different method, we set ourselves to a careful and diligent self-culture, praying and worshipping as a part of the process, and for the sake of the effect, noting our defects, chastening our passions, cherishing our religious tastes and sentiments; then, in one or the other of these methods, we may go steadily on, it will be imagined, clear of all fluctuations, maintaining an even, respectable, and dignified piety. Yes, undoubtedly we may, and that for the very reason that we have no first love to lose, no fervors to be abated, and, in fact, no divine birth or experience at all. The piety commended is, in either case, a kind of stalagmite piety, built up from below, with the disadvantage of no drippings from above; a really cavernous formation, upon which the' true light of day never shone. In some cases, the soul may pass over in this manner imperceptibly, into some faint experience of God that is genuine; but the dignity it boasts is the dignity of a consistent poverty and ignorance of God, and nothing is more easy to be maintained. On the other hand, the very reason why there are so many phases, or seeming lapses, in christian experience, is not because it is false, but oftener because it is genuine; because God has really dawned upon the soul's faith, and kindled a fire supernatural in its love. Hence, to settle it into this high relation, as a properly known relation, is often a work of much time and difficulty. The problem is neither more nor less than to learn the way of God, and come into practical acquaintance with him. And how can this be done without a large experience of defeat and disasters endlessly varied. How can a being so weak and ignorant, knowing, at first, almost nothing of the high relations into which he has come, learn to walk evenly with God, save as he is instructed by many waverings, reactions, irregularities, and throes of losing experience. Grazing in the pasture ground of a mere human culture, we might show more plausibly; but now we move irregularly, just because we are in a level where the experience of nature does not instruct us. We lose ground, fall out of place, subside and waver, just because we are after something transcendent, something above us; climbing up unto God, to rest our eternity in him,--a being whom, as yet, we do not sufficiently know, and whom to know is life eternal. Therefore we best like that kind of life which appears least plausible in present show, well understanding that, if nothing more were in hand than simply to maintain a level march, on the footing of mere nature, there is no feeblest christian, or even no-christian, who could not do it triumphantly. The fact then of a truly first love, the grand christian fact of a spiritual conversion or regeneration, is no way obscured by the losing experiences that so often follow. On the contrary, its evidence is rather augmented by these irregularities and seeming defections. And, if it be more than nothing, then it is, of all mortal experiences, the chief; a change mysterious, tremendous, luminous, joyful, fearful, every thing which a first contact of acquaintance with God can make it. Where the transition to this state of divine consciousness, from a merely self-conscious life under sin, is inartificially made, and distorted by no mixtures of tumult from the subject's own eagerness, it is, in the birth, a kind of celestial state, like that of the glorified; clear, clean, peaceful, and full, wanting nothing but what, for the time, it does not know it wants;--the settled confidence, the practically instructed wisdom, the established and tried character, of the glorified. And yet all the better is it, imparadised in this glory, this first love, this regenerative life, this inward lifting of the soul's order, that a prize so transcendent is still, in a sense, to be won or fought out and gained as a victory. For life has now a meaning, and its work is great; as great, in fact, in the humblest walks and affairs as in the highest. And the more difficulties one has to encounter, within and without, the more significant and the higher in inspiration his life will be. The very troubles that others look on with pity, as if he had taken up a kind of piety more perilous and burdensome than was necessary, will be his fields of victory, and his course of life will be just as much happier as it is more consciously heroic. He has something great to live for, nay, something worthy even to die for, if he must,--that which makes it glorious to live and not less glorious to die. This war too is one, my brethren, as I verily believe, that, in all that is bitterest and most painful, may be effectually carried and ended without waiting for the end of your life. The bitterness and painfulness are, in fact, nowhere, except in the losing or apparently losing experiences of which I have been speaking, and these may assuredly be surmounted. There is a standing above all sense of loss, a peace of God that can not be shaken, a first love made second and final, into which you may come soon, if you are faithful, and in which you may abide. The doctrine of Wesley and his followers may be exaggerated, or partially misconceived; I think it is. They appear to hold that there is a kind of second conversion, higher than the first, which they imagine is complete sanctification. But it is, if I am right, neither more nor less than the point of the first love reached again, with the advantage of much wisdom or self-understanding brought back with it. The disciple is, for that reason, stronger, wider in volume, more able to abide or stand fast. But, if he is not strong enough, he will very certainly take another circuit, and perhaps another. Enough that there is hope,--that there is a state of profound liberty, assurance, and peace, which you may attain to, and in which you may abide. Indeed, the original love itself was but a foretaste in feeling, of that which you may achieve in wisdom; and you are to set that mark in your eye, expecting to emerge again, or to climb patiently up into a state of purity and fellowship closely resembled to that. If, then, you have now become entangled, discouraged, darkened,--if you seem to have quite given over,--blame yourself, not in your infirmity, but only in your sin. See, if possible, exactly what and where your blame is, and let your repentances and confessions exactly cover it. Probably you did not fall consentingly, but you seem to have been thrown by your own distracted, half illuminated mind. You struggled hard, and with so great self-exertion, not unlikely, that you fell out of faith, and were even floored by your struggles themselves. You fanned the love so violently that you rather blew out than kindled the flame. The harder you lifted, the deeper in mire you sunk. At last, you gave over with a sigh, and fell back as one quite spent. And now, it may be that you even look upon the whole subject of spiritual religion with a kind of dread. It wears a painful and distasteful look. And yet there is one bright spot in the retrospect; viz., the gentle, ingenuous, heavenly feeling, the peace, the cleanness, the fullness of heart, the liberty in God and his love, the luminous, inward glory; and, if you could see nothing else but this, how attractive the remembered blessedness would be; the more attractive for the emptiness you have since experienced, and the general distaste of the world, which so often afflicts you. Nay, with all the disrespect you may possibly put on this former experience, it is precisely this and the opening of your higher nature in it, that makes a great part of the distaste you now suffer toward the world. What a call then have you in this joy remembered! And God indorses it, offering to seal all this upon you, and more. He blames you not for any thing unavoidable, he only blames you for your letting go of Him, and your final surrender of the struggle. This he waits to forgive. He will do more, he will even make what is blameable in your sad loss and defection turn to your account. Can you ask encouragement to a new effort better than this? Come back then, O, thou prodigal, to thy father! Quit thy sad folly and emptiness, thy reproaches of soul, thy diseased longings, and thy restless sighs. Return again to thy God, and give thyself to him, in a final and last sacrifice. Ask the restored revelation. Conquer again, as Christ will help you, the original love, in that to abide and rest.